The European Congress of Neurosurgery, organised by AIM Group International for the fourth consecutive year, is a key event for the medical community. The 2018 congress is currently taking place at Square Brussels Convention Centre, with a boost in sponsorship and more successful all-digital tools. 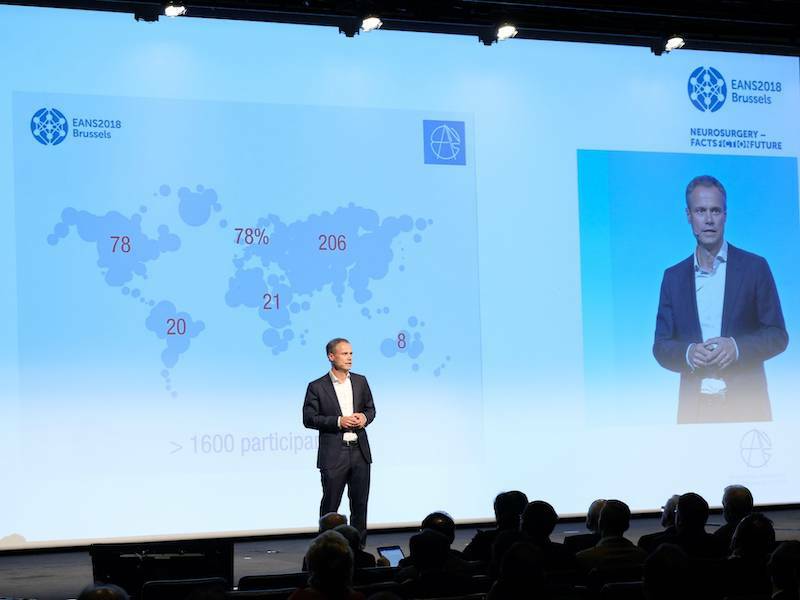 More than 1,500 European neurosurgeons have come to Brussels for the EANS2018 Congress (Square Brussels Convention Centre, 21-25 October) to share current best practices and look at future developments, through a combination of interactive courses, plenary sessions and high-level discussion platforms. Powerful learning. Contents are relevant: the three days include 99 Scientific Sessions , based on 1,100 selected abstracts. More space is given to small interactive sessions with 23 Masterclasses, where a small audience can freely interact with well-known surgeons discussing clinical cases. A new communication format of Science Slams is in the program, a contest where young physicians have a short time to present their research projects in an effective and appealing way, which will be evaluated and voted for by the public. Digitalisation. Several scanning stations are provided for attendees to complete the evaluation for CME credits. A quick and easier all-digital procedure. In addition, for a complete digital experience, also the poster area is on touch screens with user-friendly, interactive e-posters. Increased sponsorship. One of the objectives of the congress was to create more valuable partnerships, to attract new and more sponsors and increase sponsorship revenues. After a working with the sponsor community – which has been strengthened in the previous congresses organised by AIM Group – more sponsorship opportunities were found. This has resulted in a substantial 26% increase in sponsorship & exhibition revenue, and a 30% increase in the sold exhibit area. More networking. The opportunity to meet informally other international colleagues is increasingly important for medical congresses. So the collateral social programme propose some ad hoc events with a mix of traditional and modern attractions, from the Autoworld Brussels Museum for the networking dinner, to the prestigious Palais D’Egmont for the Presidential Dinner, or the iconic Brussels City Hall for the international closing dinner.